1. Hover over the Competitions menu and click on Venues. 2. On the right hand side click on the Add button to add a new venue. Note: The online system doesn't contain 'sub-venues', so all playing venues and fields will need to be added individually. Tip: When adding your Venues be sure to use the Google mapping tool to pin point the exact location of your venue(s). This will make sure that the location of the venue can be viewed on your website by members/ players etc. 2. 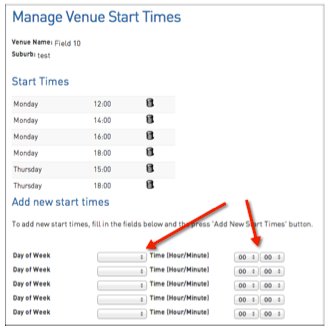 In the Start Times column click on View for the venue you wish to configure. 3. In the Day of the Week and Time fields simply enter in the time slots for that venue (ie. If matches run at 1pm, 3pm, 5pm on Saturdays enter in each on of those time slots). Once you've entered this in they will then display under the Start Times on that page (as above).